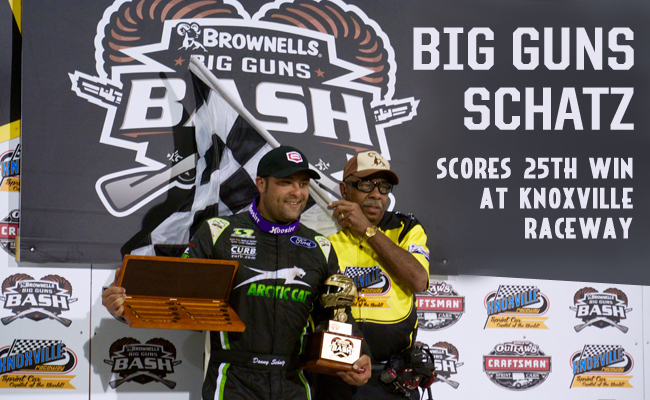 KNOXVILLE, IA — June 10, 2017 — Tony Stewart/Curb-Agajanian Racing driver and eight-time World of Outlaws Craftsman® Sprint Car Series Champion Donny Schatz officially joined the ranks of the top-10 winningest drivers at Knoxville Raceway, leading all 25 laps of the Brownells Big Guns Bash night two Feature. The win marks his 25th career win at the 1/2-mile oval, tying him with two-time Track Champion Skip Jackson. It also marks the 10th win of the season for the No. 15 Arctic Cat car. Much like the previous night, in which Brad Sweet led flag-to-flag, an exciting battle took place behind the leader, resulting in the same three Outlaws to the podium, only slightly rearranged this time with Schatz on top. And he was unusually happy about it. Behind Schatz, David Gravel, Brad Sweet and Ian Madsen fought a tough battled for second and third. A caution on Dakota Hendrickson four laps in gave Madsen the chance he needed to jump past Logan Schuchart, then Daryn Pittman. A second caution — from Jason Sides spinning into the wall in turn one — allowed Gravel to slide inside Sweet, leaving Sweet momentarily at Madsen’s mercy as the two exchanged positions a couple of times almost halfway through the Feature. But Sweet prevailed, and with only eight laps to go pressed on Gravel for second as he got caught in lap traffic. Despite the heat and strong winds, the track was in great condition on night two and did not rubber up at all like the previous night. Unfortunately, Sweet was unable to comment after his win, as the heat and the tough workout left him dehydrated and worn out enough to warrant medical attention. The World of Outlaws Craftsman Sprint Car Series returns to action on Tuesday for the Eagle Nationals in Eagle, NE. Tickets are available online. The Series will then continue to Schatz’s home state of North Dakota on Friday and Saturday.